At a time when several presidential candidates have said they would end President Obama’s executive actions that have shielded young unauthorized immigrants from deportation, some of the program’s recipients are setting down roots by purchasing a home. Yesenia Ariza is one of them. The 28 year old achieved her longtime goal of becoming a homeowner in June 2014. She purchased a house in Chicago, where she has lived since she came from Mexico with her parents when she was just 1 year and three months old, and she didn’t do it alone. She bought her house with the help of The Resurrection Project, a nonprofit organization that has helped about 20 DACA recipients in Chicago become homeowners. Ariza bought her house after getting approved for Deferred Action for Childhood Arrivals (DACA), a program Obama launched in 2012 that allows qualified undocumented young immigrants brought to the United States as young children to gain temporary protection from deportation. Though it does not put young immigrants on a path to legalization, it gives them the chance to apply for a work permit and a social security number and renew their DACA status every two years. 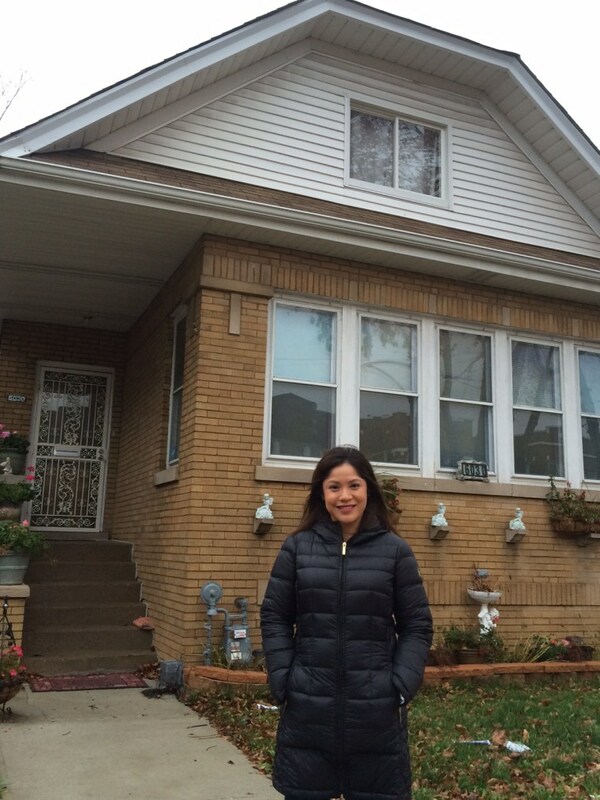 Yesenia Ariza, 28, stands inside the house she purchased recently with the help of The Resurrection Project, a Chicago-based nonprofit organization. The program has allowed young immigrants to attend college, get jobs and obtain driver's licenses, among other things. Even before DACA was announced, Ariza had already been preparing to buy a house. She began working and building up her credit at age 16, paid her way through college and saved money for a house down payment. When she was approved for DACA in 2013, she transferred her credit history, which she built using an Individual Taxpayer Identification Number (ITIN), to her new social security number. She also used her psychology degree to get a job working as a home-based service provider for people with developmental disabilities at a non-profit organization called El Valor. Ariza said that before she bought her house, she wasn’t concerned that DACA is only a temporary program, since recipients can apply to renew every two years. But now that she hears several presidential candidates saying they’d do away with it, she’s starting to worry. “It was a very emotional day for me,” said Yesenia Ariza, 28, describing how she felt the day she was handed the keys to her house. "It's nice to come home and know that it's mine." Sen. Marco Rubio recently said that if elected president he would end DACA even if Congress doesn’t pass immigration reform legislation. Other Republican presidential candidates, including Donald Trump and Sen. Ted Cruz, have also said they would immediately get rid of the program. Meanwhile, the Democratic presidential candidates are saying they would keep the program. President Obama had announced an extension of DACA including one for parents of citizen or legal resident children (DAPA), but it was blocked by a judge after several states sued; it is expected the Supreme Court will take on the case. Dr. Raul Hinojosa, director of the North American Integration and Development Centerat UCLA, said doing away with DACA would “significantly hurt” the U.S. economy. He pointed to a report he authored that found DACA recipients have seen an “extraordinary” growth in their earnings, and are therefore increasing their buying power. In addition, Hinojosa said now that it appears some DACA recipients are starting to become homeowners, they’re showing signs of having economic stability. “Owning a home obviously shows you are a very responsible member of society and a very important contributor,” he said. It’s unclear how many DACA recipients have become homeowners because very little research has been done on the matter. A United We Dream survey of 1,759 DACA recipients found that 12 percent of respondents said their name is on the lease or mortgage where their family lives. The survey, however, didn’t ask DACA recipients if they own a house or are planning to buy one soon. Lautaro Diaz, vice president of housing and community development for the National Council of La Raza, said he suspects that like many Latinos in the U.S., DACA recipients want to purchase a home to stabilize their housing situation, create a place where their families can grow and build wealth. The Resurrection Project is one of the few organizations in the country helping DACA recipients become homeowners. The Chicago-based group encourages DACA recipients who want to buy a house to first attend workshops that address everything from understanding the pros and cons of owning a home to finding the best mortgage loan. Once DACA recipients have attended the workshops, they’re paired with commission-free realtors who work with them to find a house. They also meet with financial counselors who help them pick a house that’s within their budget and to apply for down payment assistance programs. “We work with an individual from the beginning to the end of buying a home,” said Kristen Komara, vice president of financial wellness at The Resurrection Project, adding that all their services are free. She said a problem DACA recipients are running into is that not all banks are willing to issue mortgage loans to DACA recipients. She thinks it’s mostly because banks are still not familiar with the DACA program, and not necessarily because DACA recipients don’t have a good credit history or can’t afford monthly payments. The Resurrection Project knows of at least two banks in Chicago that do lend to DACA recipients. The group is working to educate other banks about DACA.